There’s something magical about bookshops. It’s easy to let the rest of the world fall away as you browse gateways to hundreds of different stories, surrounded by friendly people and the soothing smell of books. Some bookshops are so enchanting that they’ve become destinations themselves. We’ve hunted down ten of these unique bookshops spread across the UK and Ireland. 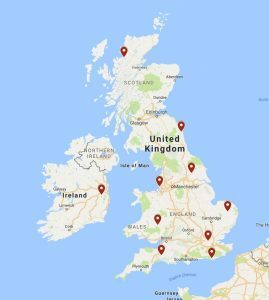 They are listed here, north to south, for eager readers to discover. This bookshop is also a hotel. The actual bookshop offers a range of books displayed on sleek black shelves interspersed with artwork. The hotel rooms further encourage bibliophiles. There are no TVs in the rooms. Instead, each room has a radio and its own small collection of books. Guests can also access the shared library and cosy reading area. The stunning view, comfy chairs, soft lighting, and easy access to books makes this a perfect reading retreat. This second-hand bookshop, one of the largest in Britain, used to be a Victorian railway station. The generous space has been transformed with row upon row of book shelves, reading spots, and hidden wonders. It’s so big it even has a floor plan. In addition to the vast range of books, there’s a model railway, lit fireplaces in the winter, and frequent talks on books. 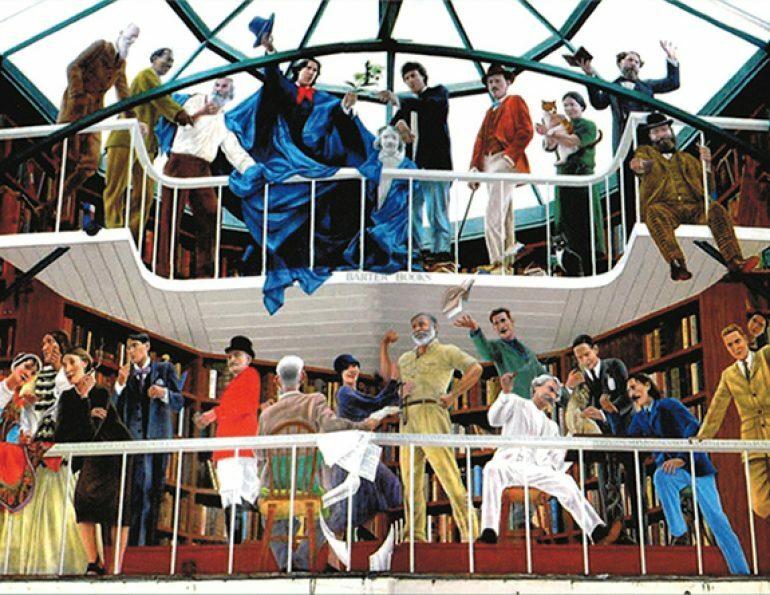 Best of all is the mural of famous writers. This colourful piece of art, painted by Peter Dodd, features a number of writers such as: Jane Austen, Mark Twain, Charles Dickens, and so many more. A close up with descriptions is available on the shop’s website. This comic bookshop chain strongly believes in building a community. Not only do they sell comics and graphic novels but they also stock games and hold regular gaming events. They even do role playing games (RPGs). They want everyone to know that comics and games can be enjoyed by adults as well as children. Just like books, comics can be on any number of subjects, it’s all a matter of finding the right fit. Best of all, the Travelling Man also participates in the annual free comic book day in May. Not only do Write Blend offer a wide range of adult and children’s titles, they also frequently host a variety of exciting events. This well-presented and spacious bookshop becomes quite packed on these popular nights. In addition to regular author signings they also offer a Novel Writing Course. This monthly class requires no experience and aims to help writers complete their novels. For poets and poetry lovers there’s a monthly open mic night, while young readers can join the weekly Moo Music Sessions which Write Blend host. This friendly bookshop encourages book browsing with shop copies. Readers are welcome to take these books off the shelf and get a real feel for the work over a cup of coffee without having to worry about damaging the book. Browsing copies for children are also available. Staff are always happy to help with recommendations but they also do video book reviews online. Not to mention Blessington Bookstore also sells wool and holds weekly Sip and Stitch mornings. This inspirational ‘not-for-profit’ indie bookshop is run by a community that banded together in 2013 when the existing bookshop threatened to close. It is now staffed by volunteers who understand the importance of reading and hope to share their passion with others. The shop holds book clubs for both children and adults to encourage friendships and book discussions. They’ve also built a Sharing Shelf outside of the shop where customers are welcome to leave books for children who may not be able to buy one in the shop. Visit Kett’s Books’ website to learn more about their unconventional beginnings and their work in the community. This light and airy bookshop features an open floor plan, skylights, plants, and, most importantly, rows of bookshelves to peruse. There’s a studio, which frequently holds Pilates and yoga classes. That’s not all, this bookshop also has a cinema! Enjoy the cosy space with luxury seats and artistically jagged stonewalls while watching the latest films. Richard Booth’s Bookshop also shows National Theatre Live productions. This bookshop is ‘dog friendly to friendly dogs’. Alongside the more traditional bookshop charms such as a monthly book club, interestingly random gifts and other extras this shop is pro-dog. If you check out their twitter you can see the occasional doggy visitor. Otherwise, they have an adorable page on their website where you can send in a picture of your own furry friend or just ooh and ahh over the ones already there. Amongst warm wooden shelves and a good selection of books this shop also stocks a delightful variety of wine. Find the perfect book and wine pairing by consulting the WSET (Wine & Spirit Educational Trust) qualified staff. Check their Facebook page for any new wines and book events they offer. This beautifully renovated barn turned rustically charming bookshop holds two floors of carefully selected new and old books. With cosy nooks, soft carpets, and inviting armchairs you can enjoy the warm atmosphere as you linger over the books. Best of all, you can become a part of The Friends of Much Ado. This membership gives you 20% off books and a discount on events and workshops. Even more excitingly, members can access the Friends’ Room. This space is packed full of books, comfy chairs and a writing table. Members also receive free reading consultations and can share books with other Friends using the Swap Shelf. 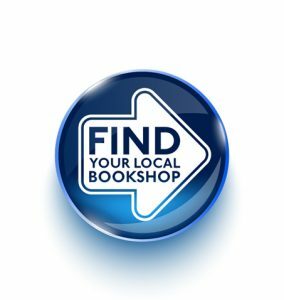 Want to share any bookshops close to your heart? Comment or tweet us at @FairlightBooks! Or click the button below to start exploring your local wonders! Need more books before payday? Find out how to borrow eBooks and audiobooks from your library!